Every time a field trip at school rolls around, I always dread reading those words on the permission slip: "Please enclose $5 cash." Kidding. 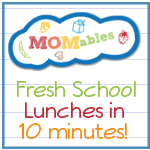 I wince when I read the "Please send a disposable lunch with your child." Ughhhh. Not only do I hate the thought of all that waste, but I don't even have the requisite supplies lying around. 153 reusable bentos, yes. Packet of paper sacks and cheap plastic baggies, not so much. And I hate seeing all that plastic destined to lie around in a dump somewhere. You could argue that the paper bag will biodegrade, but you can't just dump all the food in there willy-nilly. 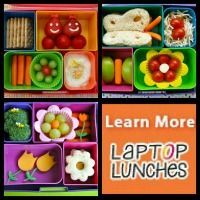 That's one of the reasons I started using bento boxes in the first place! To keep my sandwich un-squished, and chips un-broken! Since it's end-of-school-year field-trip season, this seemed like the perfect time to post! The first time I was faced with this issue, I had remembered reading once about using an old berry clamshell container to pack a disposable lunch in. Sadly, we were fresh out of those. So I tore through my supplies, trying to find something, anything I could use. I ended up finding a plastic 12-cup mini-muffin-type tray that had once housed some Trader Joes mini quiches. I had saved it with the idea of maybe using it for a Muffin Tin Meal someday. Instead, I cut it in half and made her a pumpkin patch field trip bento. The tray itself was recyclable, and I used aluminum foil wrapped over the top to cover it. Also recyclable! Sadly, the pumpkin patch didn't have recycling bins to utilize. But still. And while it was nice getting to show off my efforts to the teachers and other volunteer parents, and getting the acclaim I so richly deserve, the real reward was watching her eat every. single. morsel! Candy Girl at BentOnBetterLunches not only re-used a tomato container, she also washed and refilled a recyclable bottled water! 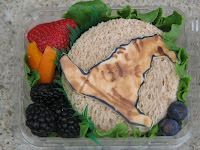 Jenn at Bento For Kidlet packed this Harry Potter lunch in an old tomato container too! Shannon from What's For Lunch at Our House packed this lunch for a NASA field trip in a repurposed blackberry clamshell. She even made custom disposable picks out of toothpicks, stickers, and cardstock! 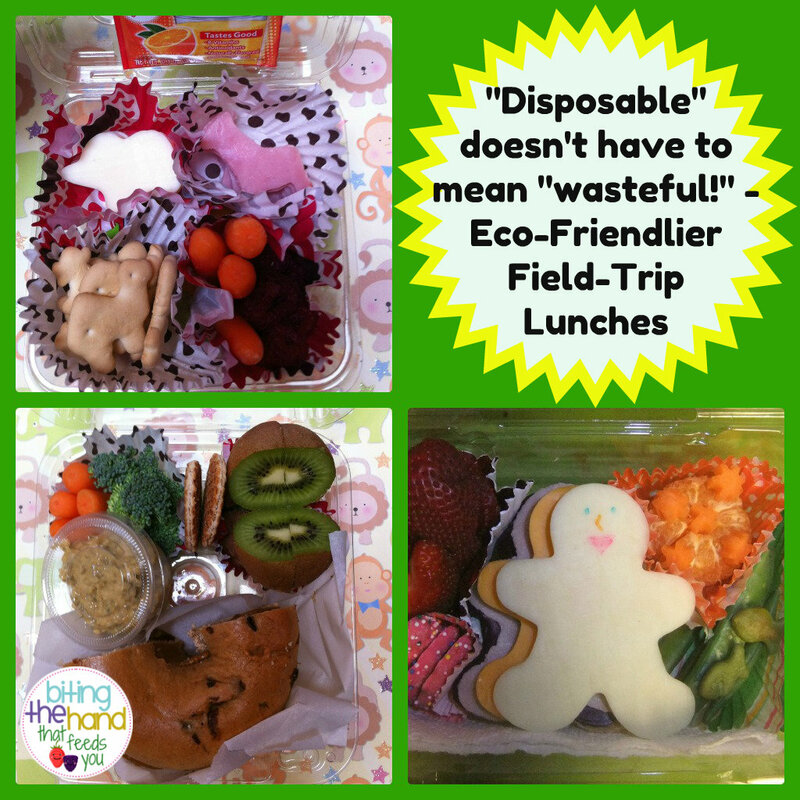 And while not technically recyclable, check out the re-used "doggy bag" styrofoam container bento she made for another field trip! Keeley from Keeley McGuire Blog not only packed a disposable lunch in an old strawberry container, but she personalized it and used a ribbon to keep it closed! Too bad Hubby made me throw out my collection of ribbon scraps last Christmas! I knew they might come in handy some day! Sherimiya from Happy Little Bento, however, is the mistress of re-using containers for disposable field-trip bento! 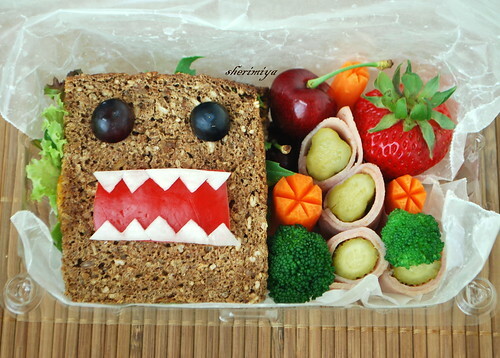 My favorite is her Domo-kun bento. 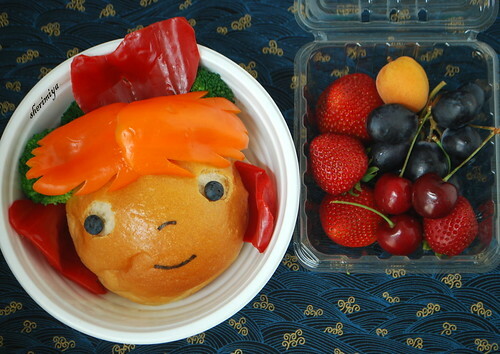 ...and re-uses a disposable lidded bowl for her Ponyo bento! So after being inspired by these fabulous Mamas, here's mine for her trip to the Children's Museum. And a half-size strawberry container for another class trip, this time to the zoo! I re-used a plastic muffin/cupcake box for my lunch for a field trip to the zoo. Tracie from Lunch, Snack and "Sninner" re-used a disposable compartmentalized pre-packaged meal container for her daughter's field trip. 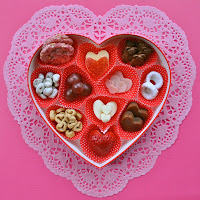 Candy Girl from BentOnBetterLunches did a snack tray in an old Valentines chocolates box. I love this idea because if you used paper cupcake liners and wooden/paper toothpick flags, the whole thing is compostable! (with the foil-free variety of chocolate box.) If, like me, you didn't happen to get the gift of chocolate last Valentines Day, or forgot to save the box, you can also do this with the regular old square boxes. What? But this brand-new box is still full of delicious chocolatey goodness? Well, guess I'll have to take one for the team! 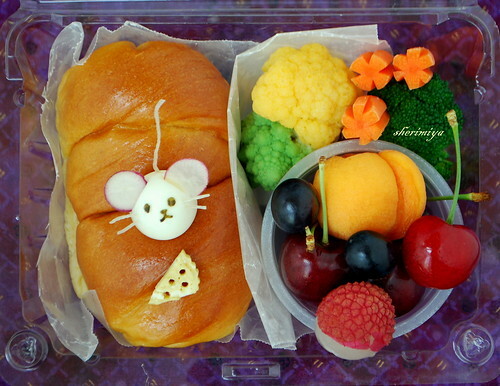 While this one from Bento Minions shows a styrofoam carton (which is still re-using, so good on ya!) you could use a cardboard carton instead. To help keep the food from falling out the open side, if you were using half a carton, you could use parchment or wax paper to form a "wall." I would probably also use cupcake liners to keep the food off the original cardboard, if I was feeling squicky about it. 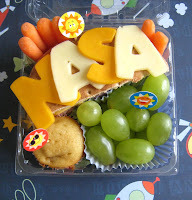 Check out this DIY cardboard bento box for a field trip from Mommy Unglued! While wax paper is technically biodegradable, it can leave behind traces of petroleum. Yum. Better than plastic though! Parchment paper and butcher paper are both biodegradable and compostable! Aluminum foil is recyclable, if clean (all food oils washed off.) So not as easy, but more places have can-recycling bins versus composting bins. Paper muffin cups are biodegradable and compostable as well. And super cute! Twine or raffia to tie them closed, or a rubberband with instructions to wear it home again on their wrist rather than throw it out. Thanks to a comment I got just after posting this, here's another option: a bag (or box) that your fast food or kids' meal came in [not that *I* would ever get fast food, right? Hah!] Now I'm going to scour my house to see if I still have an intact Happy Meal box*! Wahoo! *Due to my housekeeping skills, or lack thereof, chances are very good I'll find one. You can also call the field trip venue in advance, and ask if they have receptacles for recycling or composting. If they do, be sure to coach your kids in advance on which parts go where! You mean like the kind I get at Jack in teh Box? mcDonald's, Wendy's? 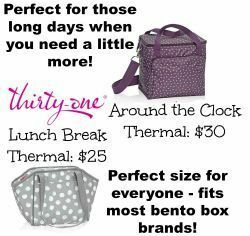 Would I get evil eye for packing lunch in one of those? Oooh good call! I'm editing this to add that idea! Thanks! You are freakin' brilliant, you know that?! haha great post Mama! :) thanks for including me and for all the great tips!! Excellent post of great ideas! Thanks for submitting! These are such great ideas!! I gave in and ordered a school packed lunch for the field trip- now I'm wishing that I didn't. 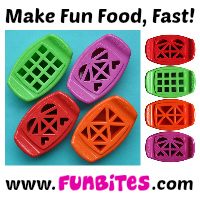 Thanks for linking up and sharing your great idea at Food Adventure Friday.